Late Sunday afternoon the younger Gravel Guy and his wife delivered a trailer filled with potato stones. Potato stones are rocks that are about the same size and shape as potatoes. They are great for allowing water to drain through them without causing erosion. I think it’s really funny that mixed in with our load of potato stones are real potatoes. I have no idea why. Each afternoon this week I have gone out and sorted through the potatoes/stones, tossing the potatoes to the side and putting the stones in the wheelbarrow to dump along the sides of the driveway. 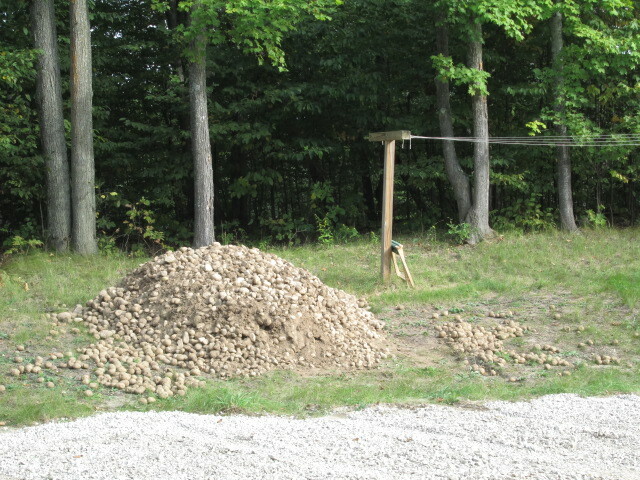 Since the forecast isn’t predicting rain anytime soon, I have been taking it easy–only taking a few loads of stones down the driveway each day. EJ and I can work harder during the weekend when he doesn’t have to work. JJ is hoping to go to college eventually, although he said he wants to wait until after winter because we have no idea how bad the weather will get. Also, he–and we–need time to adjust to this new area. So yesterday he asked me to find his high school transcript, which sort of made me panic because I wasn’t sure where it was. Since I put together his transcript after he graduated from high school (we homeschooled), I have gotten a new computer because my old one had crashed, which means anything I put on the old computer was gone. I thought I might have put backup copies of his transcript on thumb drives, but I found only one of the three thumb drives I own in my little case and that thumb drive didn’t have JJ transcript on it. JJ sometimes borrows my thumb drives and he isn’t always careful to return them so I searched his room and finally found both of them–and there was no transcript on either of them. My only hope then was to find a hard copy, but before we had moved I had gone through files and thrown a lot of old papers away–what if I had thrown away his transcript? Trying to put it together again from memory was daunting. And if I still had a hardcopy, it could have ended up anywhere in the chaos of our move. Yikes! In my attempt to find JJ’s transcript yesterday, I first worked on organizing our library. We had originally put the file cabinet in the closet, but I wasn’t satisfied with the way it fit. It was bigger than I had thought and it wasn’t easy to open the drawers. I pushed and shoved the heavy file cabinet across the room next to the desk and then I quickly looked through the files to see if there was a folder for homeschool stuff. Nothing. With the file cabinet out of the way, I put a lot of the boxes of books in the closet, as many as I could fit. There are still a pile of boxes of books in the room, but fewer than there were. (I also still have many boxes of books stored in the pantry. I can’t wait until we have time to get the bookshelves built.) As I moved boxes, I occasionally came across not-yet-unpacked boxes filled with papers, so I went through them. Nothing. I also went through the boxes of old papers and bills in the pantry. Still nothing. Then I went through the boxes of JJ’s things that are in his room. No luck. I was about ready to give up in defeat, but I don’t give up easily, so I went through the file cabinet one more time. In the very back of one drawer I finally found a manilla envelope with JJ’s school records in it. Whew! Success! AND I got the library more organized, even though I don’t have bookshelves yet. The right side of the library, where some day my shelves will be. Every year when the weather grows warm, I put my house plants outside so they can enjoy the sun and warmth. Every autumn when the weather grows cool, I bring them back inside. Every winter the cats almost destroy my spider plant, which I have had for years. They like to sleep on it and attack it. By the end of winter it is mostly dead, but safe outside again, it revives over the summer into a beautiful flourishing plant. And so it goes. I put my spider plant on top of the file cabinet and the cats are already seeking to destroy it . Last night at about 11 p.m., Danny wanted to go outside to use his “facilities.” I slipped his leash on him and grabbed my headlight, which carried in my hand and turned on as soon as we got outside. Danny went pee near the clothesline and he was just beginning to pull me farther down the driveway when I heard a strange noise. I wasn’t sure if it was a bellow of an animal or our neighbor making a noise. I’m still not sure. But then I heard a loud snort and a stamping noise. I shone my headlight down the driveway, but its light doesn’t reach very far so I couldn’t see anything. I suspected it was a deer warning me away. EJ later agreed that it was probably a buck warning me off. He said they begin to get an increase in testosterone at this time of year in preparation for mating. 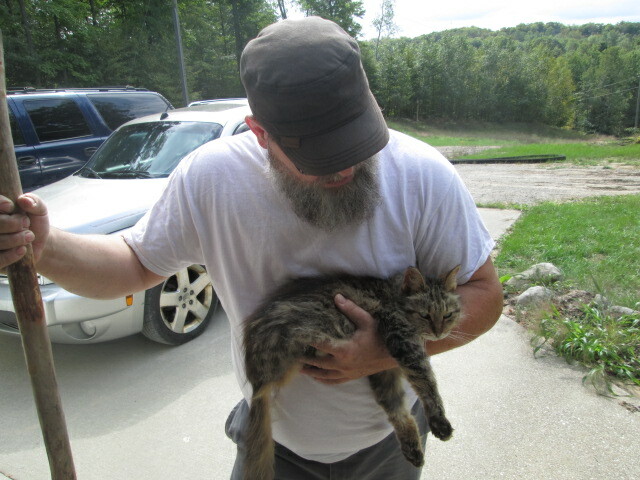 I didn’t want to risk an angry animal chasing me so I quickly pulled Danny back into the house. Yikes! I told EJ that I will try to make sure I take Danny out before it gets dark–although he doesn’t always need to go when I tell him to. EJ said that he would get us all more powerful flashlights to light up the driveway. I still want a light on a walking stick–my wizard staff. 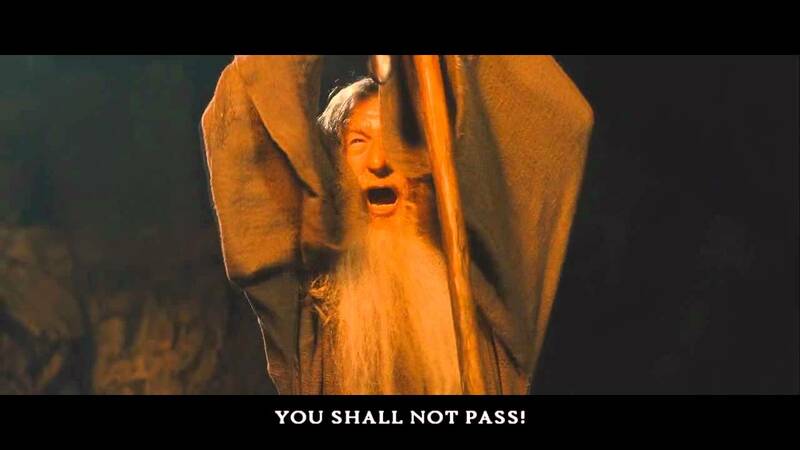 I have always wanted to shout, “YOU SHALL NOT PASS!” if something threatens me in the night. Unless it’s a threatening buck. Or a bear. Or anything really scary. The forest can be kind of scary at night especially when there is no moon and I hear strange animal noises. The other night I took a video of the darkness. Of course, you can’t really see anything in the video because everything is so black…but that is my point: It is very dark in the forest at night. But it’s also beautiful. EJ carried Tesla up the driveway. This morning EJ and I walked down to the mailbox. We saw deer tracks near the bottom of the driveway, but none so close that a buck would have wanted to warn me off. EJ said that it’s likely the deer crossed the driveway and then headed up the grassy hill where they’d leave no footprints. Danny walked down to get the mail with us…and our cat Tesla followed behind. We always have quite a parade–both human and animal–whenever we go get the mail. I stayed away from the road with the animals while EJ went to the mailbox. On the way back, he picked up Tesla and carried her up the driveway, as he often does. Tesla is getting quite old but she still follows us around. I am trying to decide what to do about my new doctor. I don’t think she is a monster. She was extremely compassionate with EJ and JJ and until my own appointment, I felt thrilled I had found us such a good doctor. During EJ’s appointment, he shared some of the stresses we have been under, including that we had struggled with my family’s emotional abuse. This helped the doctor make the diagnosis that EJ’s health issue was stress-related. However, based on the doctor’s repeated comment to me during my appointment that she “truly understands how I feel,” I think she has had experience with abuse–either herself or someone she knows. I have found that people–most of us–tend to view life through their own experiences and perspectives without understanding that even when situations are similar, they are never exactly the same, and the people involved are not the same, and in the case of abuse, no victim is at the exact same stage of recovery or works through recovery in the same way. I felt that during my appointment, the doctor saw me as a victim of abuse, a profile, a statistic, as herself or someone she knows struggling with abuse. She didn’t see ME. She didn’t listen to me, didn’t let me finish a thought, jumped to assumptions and leaped to conclusions, pressured me to take medication that I knew I didn’t need and didn’t want. She may had had the best intention to “help” me, and she may think that the reason that I cried during my appointment was because I suddenly was overcome by an awareness that finally I was getting cared for. The truth is, I think I cried because I was overtired and with her very first comment, she made me feel ambushed, unheard, and bullied. I can’t remain a patient of this doctor unless I set some definite boundaries with her. I want a doctor who works with me, listens to me, and respects my decisions. I don’t want the doctor to become a “parent” who forces on me what she thinks is best for me. Honestly, I don’t know if I even want to remain her patient because I resent her treatment of me and I no longer trust her. I think I’d just quietly find another doctor except–assuming EJ and JJ keep going to her–I’ll end up going with them on their appointments, which means I’ll see her again. So I thought I might as well be direct with her and either define my boundaries or tell her why I’m getting a new doctor. Besides, INFJ personality types crave closure. It was suggested to me that I just email her rather than waste my time on an appointment. However, any email I send her will go first to the office staff and I don’t want to cause EJ or JJ any discomfort or the doctor any embarrassment by my complaint becoming “public.” So either I keep my appointment with the current doctor and confront her one-on-one or I find a new doctor–and probably end up explaining why she’s no longer my doctor when I accompany EJ to his appointments. I don’t look forward to any of it. I have imaginary conversations with my doctor, trying to prepare to talk to her. Good luck this Dr. decision would be a hard one. I wish you well in those nights outside with the dog, and thank goodness you found that transcript. I would be in a panic about that. Happy rock moving. YAY! Whoo hoo! I’m so glad that whatever blocked you from commenting has somehow been fixed. I really missed you, Simone! The forest at night! 4 years ago we move to the edge of town, but I still miss the quite and no lights from where we did live. We were in the middle of 120 acres and we did not have an outside light but could see neighbors across on another hill. I miss the quite but not the driving 18 miles to get gas or bread. Your 120 acres sound as if they were awesome! I will have to get used to living in our forest because it’s a totally different environment than I am used to. However, even though I’m a little nervous about the darkness, I already really, really love it! We are on a rural road, but we are closer to a grocery store up here than we were at the old house.